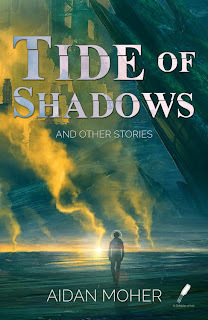 Tide of Shadows and Other Stories, is a surprisingly solid debut collection from Aidan Moher, one that ably demonstrates his love for speculative fiction, along with his intimate understanding of the genre's tropes, forms, and styles. His Preface provides a nice author's introduction, and is in itself a well-written essay on the power and the voice of the short story. Meanwhile, the Story Notes that accompany each tale provide a glimpse into his mindset as reader, acknowledging his influences, both on the page and on the screen. A Night for Spirits and Snowflakes is a grim sort of tale, one told with multiple voices, alternating between past and present. It's deliberately confusing and unsettling, placing the reader in the midst of both battle and ambush. The Girl with Wings of Iron and Down is Twilight Zone sort of tale, full of sadness and loss, with new surprises to be found on every page. It's a story with more questions than answers, with an ending that's beautifully ambiguous. Of Parnassus and Princes, Damsels and Dragons was probably my favorite piece in the collection. It's a very clever series of twists on the traditional Knight in Shining Armor trope, including one that's so perfectly absurd, I can't imagine how else the story could have ended. It's also a story that has a lot of fun with language, demanding a second (and even third) read to catch all the wordplay. The Colour of the Sky on the Day the World Ended is the shortest piece in the collection, a bit of flash fiction that manages to pack a lot of story and emotion into just 700 words. Tide of Shadows wraps things up with a story that, on the surface, seems to be an odd mix of coming-of-age space opera and hard military science fiction. The snippets of life are only the top layer of the story, however, with the motivations, last thoughts, and conflicting emotions of the crew comprising the most interesting aspect. Offering a little something for everyone, Tide of Shadows and Other Stories is a collection of tales that know precisely how to engage the reader, and exactly how to find a climax without overstaying their welcome. Whereas some authors try to put too much into a short story, or are content to sacrifice content for style (or vice versa), Moher strikes that perfect balance. Thanks, Dezmond! I have a lot of fun coming up with titles, and, in fact, sometimes I'll come up with a title first, and then write a story to match.